I brewed today. The beer that I brewed was a Single Malt, Single Hop (my first one) that I am calling 42 SMaSH Pale Ale. Its grain bill is 100% Marris Otter and its hop is Centennial. It is probably hoppy enough to be considered an IPA, but maybe not and it should be low enough in ABV to be more in the APA range. I am officially calling it an APA. Brew day was far from perfect and I have no idea how this beer will turn out. Last time I brewed, I broke my floating thermometer, and I forgot to buy a new one when I bought my ingredients. So, early this morning after I realized my mistake, I used a meat thermometer to measure my strike water temperature. It made me miss my floating thermometer that I could just leave in the water and in the mash. I'm not sure I trust the accuracy of the readings either. Today I bottled my 2012 X-Mas Ale. You may or may not remember that I brewed this batch towards the end of October (see Brewing the 2012 X-Mas Ale if you would like to refresh your memory). It had a very vigorous fermentation with lots of blow-off. After a week, I racked it into a secondary fermentor along with about 1 tbsp of peppermint extract. It has been in the secondary almost 3 weeks. I thought the sample I had today seemed like about the right amount of peppermint, but I think maybe this beer is going to be another one that has a schizophrenic flavor. Some days I will think it seems awesome and on other days it will seem to have too much peppermint. Last year's X-Mas Ale was that way with its hazelnut flavoring. If you subscribe to as many beer blog RSS feeds as I do, you have probably seen a bunch of blog posts about pairing beer with Thanksgiving dinner. For example, there is a Denver Post "First Drafts" article called Thanksgiving dinner is a perfect time to try a pairing with Colorado beers. There is a post at BeerChow called Thanksgiving Craft Beer style. There are tons of other articles out there. It is becoming more and more popular to pair beer with food, and Thanksgiving is the biggest holiday meal of them all. Beer has an advantage over wine in that there is such a wide variety of flavors that make it fun to pick and choose to match up with the food. To be honest, I am not great at picking and choosing my beer based on what food I am having. I tend to like all kinds of beers with all kinds of foods. Sometimes I think about and choose my beer based on what I am eating, but it is not something I really try too hard at. I don't really drink wine, so my adult beverage of choice for any meal is beer, and over the past several years, especially, it has always been local craft beer with my Thanksgiving meals. Last year, I was at my sister's house in Wisconsin, so I had some midwest regional beers. This year, I am in Colorado, so I am drinking (mostly) Colorado Beers. I am disappointed with the results of the recent presidential election. I am not a fan of the president's policies, and I think the country would be better off with a change of leadership. One thing that I am a fan of, though, is that some of the White House staff home-brews. That is cool. 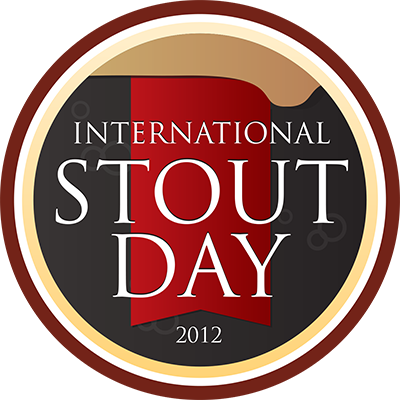 Here it is International #StoutDay again. I was going to go out and grab a half-growler of some local small brewery's stout today, but things just got too busy at work and I decided to just head home after. I do, after all, have beers at home. 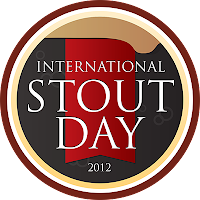 I was able to earn the 2012 untappd Stout Day badge tonight with my world-famous Stouticus American Stout. It is now a tradition that I cannot stop ... sharing the badges that I've earned on Untappd (see First Month of Untappd and Running for Mayor @BallyFitness , and Some more Badges @Untappd , and Still More @Untappd Badges), and Still More @Untappd Badges 2 and Still More @Untappd Badges 3 and Still More @Untappd Badges 4 and Still More @Untappd Badges 5. You may remember that last month, I participated in "The Session" (aka Beer Blogging Friday) with Novelty Beers ... Oct 2012 "Session". It was fun and I think maybe it drove a few new beer geeks to my blog, so I am doing it again this month. 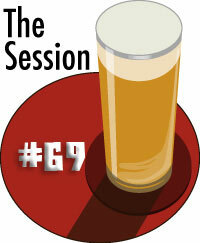 November's topic is hosted by Jorge at Brew Beer and Drink It. His topic is "The Perfect Beer World", which is pretty much wide-open. We know the world of beer isn't perfect. What would I do to improve it? This pretty much summarizes what I feel about people who drink Michelob Ultra or Miller 64. Generally, I will not ridicule someone for drinking a particular sort of beer, but I will make an exception if I see you drinking one of these. So, if I had a magic-beer-world-improving-wand, the very first thing I would do is ban Low-Carb beers. Well, the October page-views blew away September's on this blog. This of course continues the streak of monthly record breaking page-views that has been going on since May of 2011. This is not too much of a surprise as GABF seems to attract significant traffic to this blog every year.